Best freebie dip in town? Zingerman’s samples of bread with truffle-infused olive oil tops my list. This year, however, I’m wary of samples, quite sure I contracted last year’s hideous virus from a different, yet similar, dunk. Fearful of flu-infested double-dippers contaminating the culinary landscape, I chunked down the change to purchase the truffle-infused salt, a bargain compared to to the cost of truffles, uninterrupted. Plump beautiful scallops and wild-mushroom risotto would surely appreciate a dab of world-acclaimed fungi perfuming their star-status appeal. Valentine’s Day falls on Friday, and seems a fine a day as any to indulge in all of this magnificence. I could have made the following recipe increasingly delicious by stirring in an extra tablespoon of butter to the finished risotto and brushing a bit atop the scallops, after they were seared. I encourage you to do so if the added fat is of no concern. This recipe insists you have all of your ingredients pre-measured and at the ready (your mise-en-place) before diving into the recipe. Advice on searing the perfect scallop is redundant from previous posts, but it bears repeating to protect your investment. Begin with the fattest, freshest sea scallops you can find, making sure they’re not injected with that sodium solution, and your heaviest skillet. Heat the skillet over medium-high heat for a minute before adding a thin layer of canola or grape seed oil. When the oil starts to shimmer, add scallops to the pan. Don’t touch the scallops for a full minute. If you think you are burning them, remove from the heat a few seconds, adjust the heat, but leave the scallops alone! 3. After they are golden, turn down the heat to medium and cook an additional minute. Then raise the heat, turn them over with tongs and repeat the process. The scallops will be cooked, but a bit translucent in the center. Divine! I created the recipe as a romantic meal for two, but it can divided in half to serve the one and only YOU! Be good to yourself. Happy Valentines Day! BTW: I’m celebrating Valentine’s Day in New Zealand with Richard. We’ve been reading about Oceania for years – friends telling us the beauty is incomparable (a truffle glittering down under) – and it’s our turn to check out this piece of paradise. I’ll be doing most of the cooking as we skirt the coast, the South Island NZ motels and farm stays I’ve booked are equipped with small kitchens. Cooking with local foods is an enjoyable cultural immersion; I look forward to sharing my experience with fellow food and travel lovers. Stir truffle salt into olive oil. Reserve. Soak mushrooms in wine until softened, about 20 minutes. Remove from wine (reserving wine) and finely chop. In a medium-sized pan, heat stock until bubbly, then reduce to a low simmer. Melt 1 tablespoon butter in a heavy- bottomed pan and saute mushrooms, stirring, over medium-high heat one minute. Pour in reserved wine and cook until wine is almost evaporated, about 2 minutes. Remove mushrooms from the pan and reserve. In same pan, heat remaining butter over medium heat and stir in shallots. Cook, occasionally stirring, until fragrant and transparent, about 3 minutes. Stir rice into pan and toast, stirring, an additional 3 minutes. Stir in about 1/2 cup of hot stock to the rice. Cook, stirring over medium heat until stock is almost fully absorbed, about a minute. Add the remaining stock 1/2 cup at a time, stirring, and adding more broth only after the previous addition has been absorbed, about 18 minutes. When rice is almost cooked (at about 18 minutes), stir in reserved mushrooms and thyme and cook 3 additional minutes. The risotto is done when it is creamy and the grains are plump and tender with a slight bite. Remove from heat and stir in the truffle oil. As you are finishing your risotto, heat oil to medium high or high heat in large sauté pan. Gently pat scallops dry with paper towels. When oil is shimmering, sear the scallops until lightly browned on both sides and slightly translucent in the center. 2-3 minutes per side, depending on size of scallops (see above notes). Sprinkle additional truffle salt atop each scallop, if desired, but take care not to over-salt. 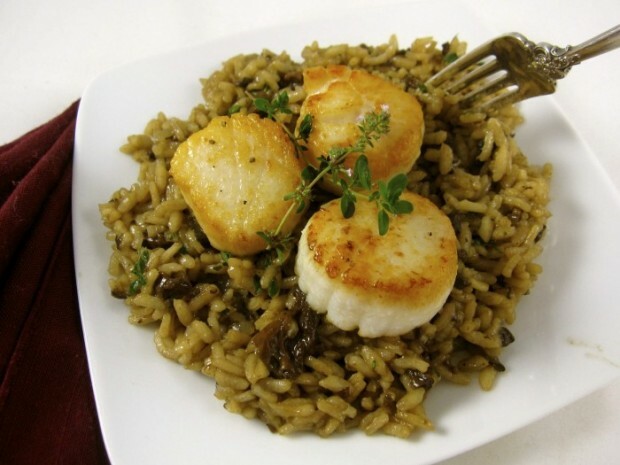 Divide risotto between 2 plates and top each plate with 3 scallops. *May substitute truffle salt and olive oil with a teaspoon or more of truffle oil. More Recipes Filed Under "Feed Your Lover"
Wow Peggy your writing about food makes my mouth water. Brilliant! I can hear your voice telling me the stories. Thank you taking us travelling the world with great food..